Living in a small town doesn’t bode well when you’re craving something like ramen. Usually I’d end up making Chicken flavored Top Ramen and hope that one day a ramen place would open up around here. Then I took it into my own hands. I was going to attempt an authentic ramen. I did a lot of research trying to find the perfect way to make authentic ramen with ingredients that I’d be able to find around town. I ended up choosing to try a classic pork ramen with a soft boiled egg and garlicky shiitake mushrooms. 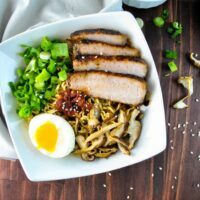 I found this website explaining how to make chashu or steamed pork. They called for a pork belly, but I could only find pork chop and it still worked well. The way that it’s cooked seals in all of the flavors of the soy sauce, ginger, and green onions giving it a really flavorful crust as well. I personally didn’t have a otoshibuta, or a drop lid, so I opted to make one with aluminum foil poking holes in the top. If you’d like to see the steps for that check out this website. I recommend trying to make the otoshibuta while the pot is empty and not hot yet. It’s a little challenging with hot liquid inside. ? The soft boiled egg was a little tricky to peel and cut through without yolk going everywhere, but I believe in you. The other great thing about this recipe is how easy it is to change up your toppings and how it’ll still be good. If you don’t love spicy, forget about the sambal. Love onions? Add as many as you’d like. Go crazy and forget about those flavor packets immediately. 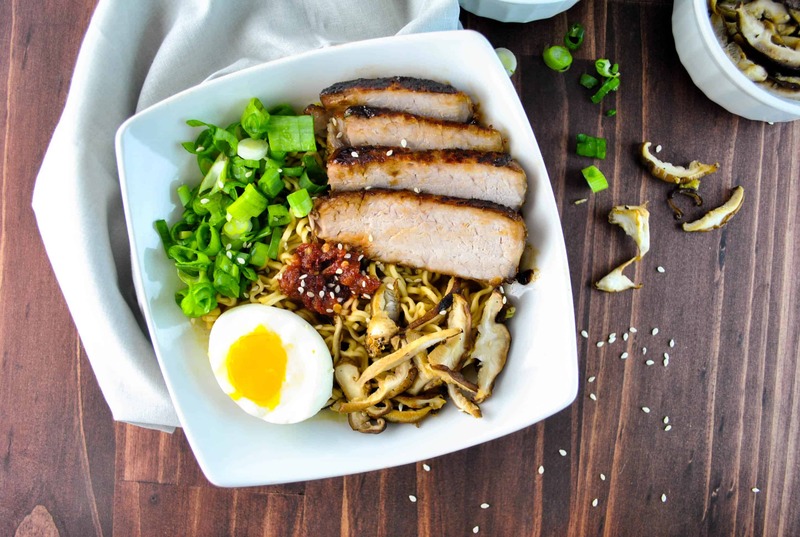 An easy Pork Ramen with garlicky shiitake mushrooms and soft boiled eggs. Heat oil in a medium saute pan and brown each of the sides of the pork, about 5 minutes. Combine water, soy sauce, rice vinegar/water mixture, sugar, green onion, and ginger in a large stock pot. Place the pork in pot and bring to a boil. Drop the temperature to simmer and place the otoshibuta or drop lid on top of the pork. Flip pork occasionally until the mixture becomes thick, between 45 minutes to an hour. Be sure to keep watching once the liquid is mostly reduced. The meat will burn if the liquid is gone. Once done, slice into thin pieces. In the medium saute pan, add oil if needed and mix together the garlic and mushrooms and cook 5-6 minutes until mushrooms are tender. Fill a small sauce pot full of water, enough to cover eggs. Bring to boil. Once boiling, drop eggs in carefully and lower temperature to keep the eggs simmering. The eggs should only be in the water 7 minutes. Immediately put into an ice bath to stop cooking. Be careful when peeling and cutting eggs as they are very gentle. Heat vegetable broth through in a medium stock pot. Once all ingredients are ready, place ramen in a bowl and pour vegetable broth over until covered. Let ramen cook through. 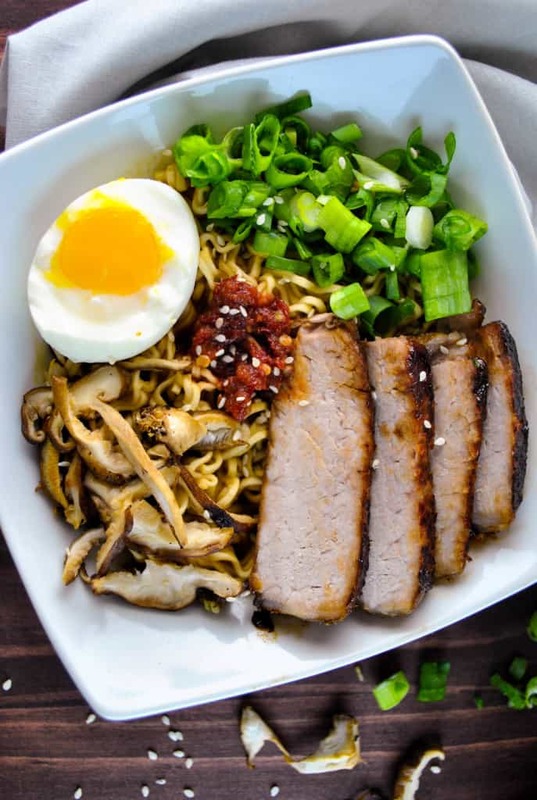 Top ramen with pork, soft boiled egg, mushrooms, cut green onions, sambal oelek, and toasted sesame seeds. Enjoy!